Sakura Watch, April 28, 2017 - finally full bloom throughout High Park for all the sakura cherry blossoms! 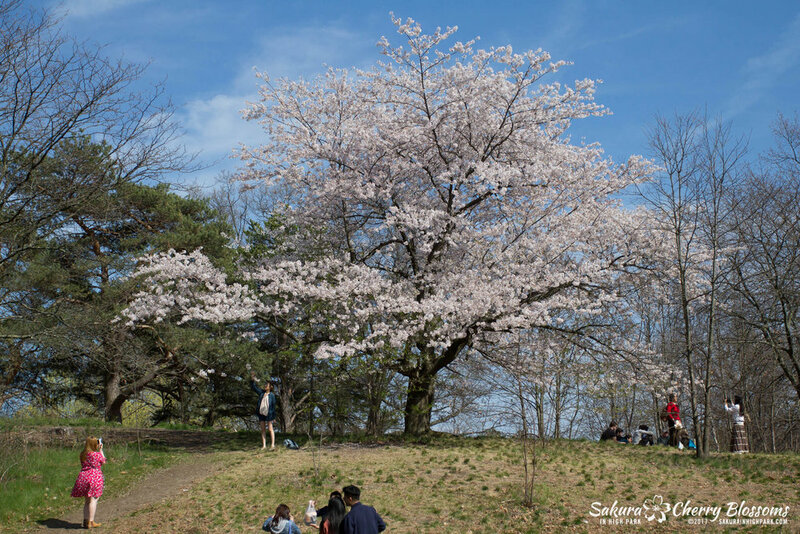 As initially predicted, this weekend of April 28-30 will be THE peak, full bloom of all blossoms in High Park. This may be the last chance to enjoy them before forecast rains beginning this Sunday to Tuesday will threaten to knock down most, if not all, the blossom petals. I took a walk through late this afternoon and posted brief highlights of the key areas on our Facebook page and as noted will go into more detail in this full report below. Always the first trees to bloom, today they looked full and fluffy with nearly most of their cherry blossoms intact. Some blossom petals were falling in the breeze but the only minor. These trees are favoured as there are many options of low hanging branches that people like to pose inside of or near. If you do this, I ask you only to be careful not to disturb the trees - DON'T PULL, SHAKE OR BREAK THE BRANCHES! Respect the trees, and you can still take beautiful photos without hurting them. Always the busiest and largest display of blooming trees in High Park, these are ALL also in full bloom. Though some trees are already beginning to show leaves which signals the blossom petals will fall soon, and as you walk down, you can already see the grounds dotted with fallen petals. 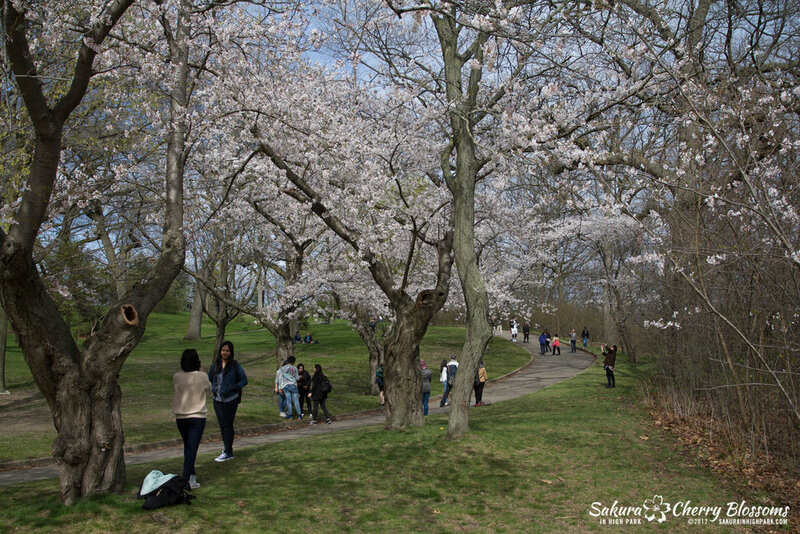 Definitely, a beautiful stroll down near the edge of Grenadier Pond will reward you with blooming trees. Most are in full bloom and bright white! These are also starting to fall gently in the breeze, but overall very full and fluffy 'cloud-like' looking displays to enjoy. Finally caught up, these sakura trees are also in full bloom! One stand-out with these cherry blossoms is that since they are the most recent to bloom, they still have retained some pink colour mixed in with the white. Another plus is this area seems to be on the other side of the park and not as crowded. If you are bringing children, this would be an ideal place as right across the street you have the Adventure Playground for the kids to enjoy, and then also the High Park Zoo on the other side. A reminder that the park will be very busy and parking near impossible unless you can get there early in the morning. Save yourself headaches and frustrations by walking, biking or taking the TTC (directions on routes are also on my map page) and make your visit a more enjoyable one!